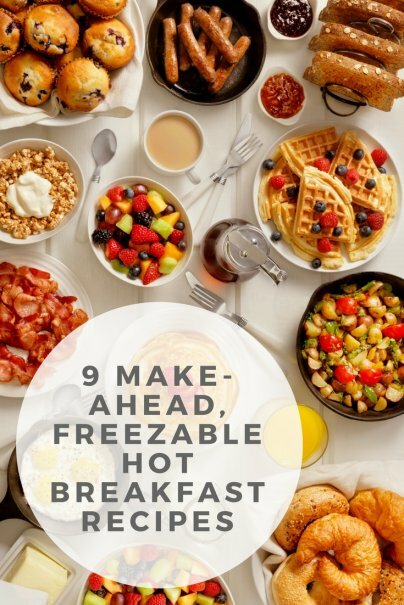 There's nothing quite like a hot breakfast — cold cereal just doesn't cut it. Besides tasting great, a hot breakfast is more likely to keep you full until lunch. Unfortunately, preparing a hot breakfast takes longer and uses more dishes than cereal and milk. And if you buy pre-made frozen breakfast meals, they are both expensive and filled with a lot of unnatural chemicals. If you prefer weekend brunch to hot weekday breakfast, these recipes also can be made ahead for an upcoming brunch and frozen. The day before the brunch, let the meal defrost in the refrigerator and then reheat in the oven on brunch morning. And to make the casserole-style recipes single-serving size, cut the casserole before freezing, wrap the pieces in tinfoil, and freeze individually. This garlic cheese grits recipe from Paula Dean is far from healthy but is possibly one of the tastiest breakfasts you will ever make. It's simple to make and will freeze for weeks. Pancakes are a great make-ahead dish, and everyone knows that pre-made store-bought frozen pancakes are expensive and loaded with preservatives. Instead, use this basic fluffy pancake recipe to make fluffy, delicious pancakes with just a few ingredients. Let them cool, and then put a piece of parchment paper between each serving of pancakes so you can easily take it out and put it in the microwave. Breakfast burritos don't need a recipe. The best part about breakfast burritos is that you can add whatever you want to the eggs, mix it up, and put it in a tortilla, and it will taste wonderful. I like scrambled eggs, fried onion, and refried black beans. Wrap the burritos up, freeze them, and heat them up for a hearty breakfast. I like to add a little salsa first thing in the morning after the burrito has been warmed up, since adding it right before eating keeps the tortilla from getting too soft. Just like pancakes, pre-made frozen waffles are expensive and filled with preservatives. You can make your own waffles cheaply and easily freeze them and pull them out when you're ready. I like this recipe for easy waffles. For something a little different, add some blueberries or chocolate chips into the batter right when you put it on the waffle iron. Make your own pie crust for the best (and cheapest) quiche. Add whatever vegetables you have in the fridge along with some cheese, and you can make a large variety of quiches. Remember to cut it after the quiche has cooled and freeze in individual portions. Two of my favorite quiche recipes are spinach and bacon quiche and cheese quiche. Honestly, my all-time favorite brunch recipe is this recipe for orange pecan French toast. It's just like the French toast my aunt used to make at Christmas time. This particular French toast is like the other casseroles in this post, which can be baked, cooled, and then cut into individual pieces, or made for one big brunch. This breakfast cookie recipe from Myscha is an all-time favorite. Who doesn't love eating cookies for breakfast? They're not quite cookies, but the ingredients in these breakfast bars make them similar to cookies. They are unbelievably easy to make, cut up, and store. These individual breakfast pies can be made in large or small muffin tins, then microwaved as needed. This recipe calls for breakfast sausage, onion, bell pepper, eggs, cheese, and biscuit dough. What combination could be tastier than that? Do you make hot breakfast most days? Would you make more breakfast it was easier and less time-consuming? So much yum here. I've also done the weekday-morning pancake thing by making a batch of batter at the beginning of the week, and cooking just a couple of pancakes each morning. I haven't been able to swallow the cost of a waffle iron. I just don't want to buy one unless I can remove the trays and put it in the dishwasher. Those are expensive ones. For pancakes, I usually just pre-mix the dry ingredients and add the wet when ready. It isn't as fast as described in this article, but good enough. I love make-ahead ideas. I always run out of room in my freezer though. :-) Really loving the Breakfast Pies. Thanks for the great article. I've been searching for Myscha's recipe on the site, I used to make it all the time, but I can't find it, wish I wrote it down. Oddly enough, my comment on Myscha's recipe from years ago, is at the bottom of Meg's recipe for breakfast cookies.